Here to my beloved 4 ingredients. 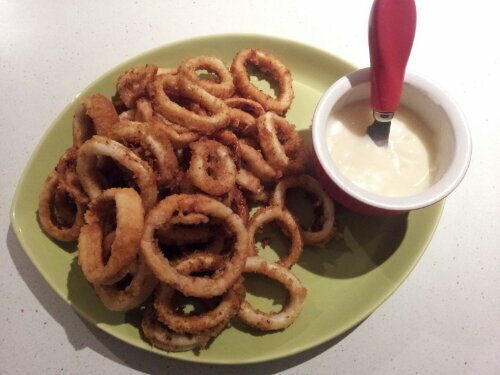 So I soaked the calamari rings in milk overnight (to become tender when cooking), then simply coated in seasoned breadcrumbs and deep Fried. The aioli was simply mayonnaise, minced garlic and lemon juice. This entry was posted in 4 ingredients and tagged ailoi, calamari, wine. Bookmark the permalink. You can post this on my fast day 😉 Looks good!